cf. ER2 post below for guidance. Please note that from Sept 1st, there will be only 1 free market snapshot each week. Please note that there will only be one free snapshot per week from September 1st. Dominant TF: all 3, with a slight advantage to shorter TFs. Options (RUT): no change, but one could consider moving calls up a bit for safety. Short Jun790 Calls, Long Jun800 Calls, Long Jun610 Puts, Short Jun620 Puts. ER2 reached 750 a little quicker I thought on May 29th, but as mentioned in previous posts the rising $ and cooling oil price calmed inflation worries, at least for now. 60mins: upper bias, but serious resistance ahead. ER2 hit 750 on May 29th and will hit it again as MTFS is still somewhat bullish despite being overbought. Entropy is quite weak though, so the resistance level is likely to hold in the short term, even if it can certainly be momentarily penetrated. A high in the mid 750s is possible before ER2 slows down. Daily: congestion, but upper trend still valid. MTFS has been undecisive with an upper bias for a while, which explained the waves we've had (short cycles of 2 to 3 weeks). Entropy is relatively weak also, but remains quite resilient. The MTFS pattern should normally nw show the white line giving up leading to a moderate retracement on this strong resistance level. However the white and brown lines point for some more fighting on the 750 level. We'll therefore have to be a little patient and carefully check ER2's behaviour on this resistance level. Obviously, EURUSD will keep on influencing markets. 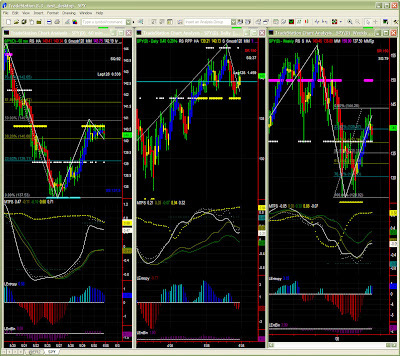 The US$ faces some resistance on 1.5333 at the moment, and the major test level now will be 1.5503. Weekly: still up, but crucial test level right here. Week after week, blue bar after blue bar, the recovery has been steady to current resistance level (Fib + MM) in the 750s. MTFS has so far failed to complete its pattern and lines still haven't crossed. 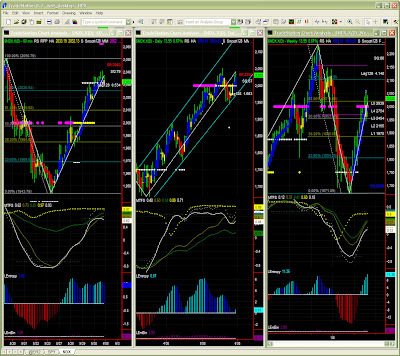 While the bias is still up, the most logical scenario at this point is a slow down and possible moderate retracement. 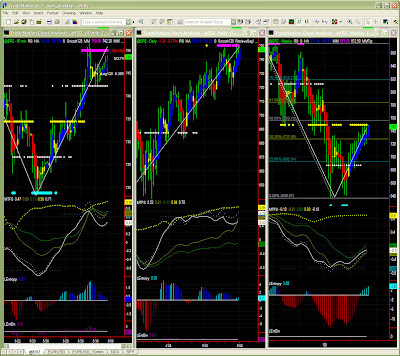 A consolidation phase would allow completion of the MTFS pattern, and let ER2 go higher later on. We'll keep into consideration that this is a crucial phase as the pattern can reverse and on the contrary turn back to bearishness, test of last lows etc. We'll obviously have to first wait for the next pivot point and then the subsequent support level, and this can take up to a couple of months.